Very comfortable, well-equipped town house with a lovely garden. Convenient for all tourist attractions, beach, shops and restaurants. Perfect for a family beach holiday. This is a nice three bedroom town house, with character of its own and a nice landscaped garden. This house has everything needed for an enjoyable holiday and plenty of space for everyone. The house is only 500 meters from the sea and within close proximity of Protaras it easily adapts to all needs. The house has everything to cater for your needs, is furnished to high standards with nice furniture to make you feel at home. Three bedrooms are all upstairs. Two with twin beds and inbuilt cupboard space, and balcony. The other bedroom is with a comfortable double bed and also plenty of cupboard space. There is air conditioning/heating throughout, a family bathroom and a guest's toilet downstairs, private garden with sun beds and umbrella. The kitchen is large and open plan with fridge/freezer, cooker, microwave, toaster, kettle, washing machine, ironing facilities, oven, extractor fan & all cooking utensils. The garden area comes complete with sun loungers and a garden table and chairs. The garden is bordered and fenced for privacy. Excellent restaurants and bars are on walking distance. A superb Cyprus holiday house in one of Cyprus best holiday resorts offering excellent holiday accommodation. The house has its own garden patio area with pergola and barbecue. Situated just 500 meters from the sandy Protaras beach. Spacious open plan lounge with TV, satellite, DVD player, & internet access, and dining area with a dining table that comfortably seats six guests. Free all necessary bed linen and bath towels. 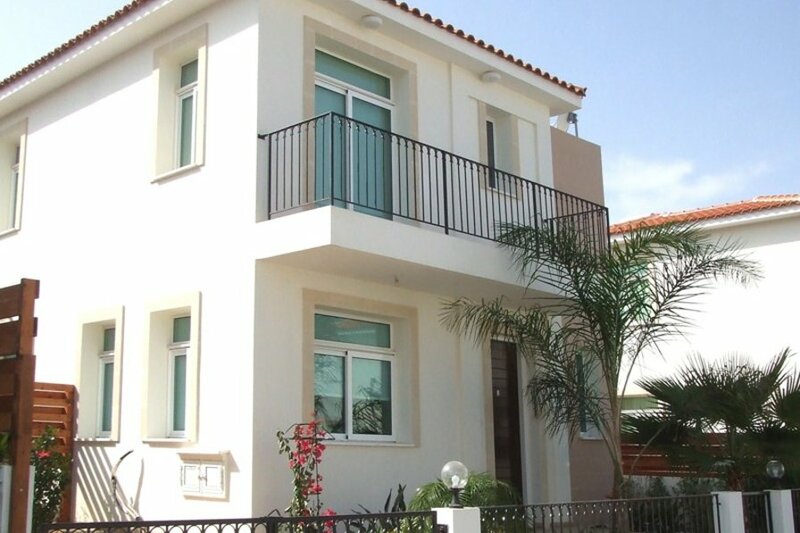 The villa is located in Protaras, one of the most attractive coastal resorts of Cyprus. A couple of minutes walk you will find bars, excellent taverns and restaurants, supermarkets, banks, kiosks and car hire rental offices. The villa ideally situated and equipped offers pure relaxation and family-orientated holiday on one of the most attractive Cyprus beaches with Boat trips, Scuba diving, Fishing, swimming and diving, and all kind of Water sports. Just beyond Protaras is Kavo Greco, which is located on the furthest southeastern point of the island, in the Famagusta region. This area contains a National Park Forest, occupying an area of 390 hectares and offers facilities for Cycling, , Horse riding,, Rock climbing, Hiking, picnicking, cycling, horse-riding,. The Scenery and views in this area are some of the best on the island.